U.S. Sen. Marco Rubio at a Senate Foreign Relations Committee hearing in 2013. Until recently, Senator Marco Rubio of Florida had occupied something of a sweet spot in Republican politics: a favorite of the Tea Party but also trusted by the establishment wing of the G.O.P. Mr. Rubio’s embrace of comprehensive immigration reform, however, appears to have upset that delicate balance, and his support has slipped among the Republican base. The mention of his name drew boos at an anti-immigration reform Tea Party rally on Capitol Hill in mid-June, and recent public opinion surveys, taken amid the debate on immigration legislation, found his favorability rating falling and his standing in 2016 Republican primary matchups eroding. Only two surveys, one by ABC News and The Washington Post and one by Rasmussen Reports, have tested Mr. Rubio’s popularity since the Senate reached the final stages of passing a comprehensive immigration reform bill. 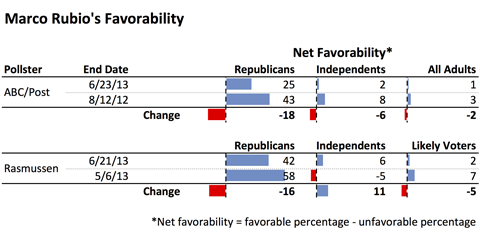 Both measured double-digit drops in his net favorability rating among Republicans. Mr. Rubio is still very popular among Republicans, just not as popular as he once was, particularly in the days after the 2012 presidential election when he became a leading Republican voice and began being discussed as a top contender in the 2016 presidential race. Indeed, Mr. Rubio led in an average of the first few 2016 Republican primary polls released after the 2012 election, but support for him has faded in more recent 2016 primary surveys. In the four national surveys conducted in January, an average of 20 percent of Republicans said they would support Mr. Rubio for the party’s nomination in 2016. 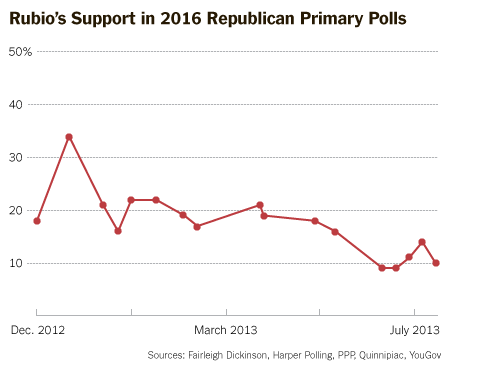 That number dropped to an average of 11 percent in the four primary polls conducted in June. Before the Senate took up immigration reform, Mr. Rubio was largely a blank slate, upon whom both establishment Republicans and Tea Party supporters could project what they wanted (a dynamic that Barack Obama benefited from in 2008). Now Mr. Rubio has chosen a side, at least on immigration, and as long as it is a top issue in the news, Mr. Rubio may be identified more with the moderate wing of his party. Had he stayed on the sidelines for immigration reform, Mr. Rubio’s wide popularity among Republicans might have lasted longer, but it is unlikely it would have remained so high indefinitely. At some point, he would have been forced to take stands on other issues that divide the Republican establishment from the base. And if he runs for president in 2016, he will have to differentiate himself from other conservative candidates with stands on virtually every issue imaginable. In other words, Mr. Rubio and his strategists may be playing a long game, sacrificing some support on the right they were likely to lose anyway for support in the middle. And while his stance on immigration reform has not yet earned Mr. Rubio a robust increase in his support among independents, that could still come. Voters who are not particularly roused to either party tend to follow politics less closely than partisans and are less likely to be focusing on Mr. Rubio’s role in the immigration debate. Mr. Rubio’s support for immigration reform may earn the support of more moderate, unaffiliated voters once they start paying more attention to politics. Of course, if Mr. Rubio does run for president in 2016, favoring comprehensive immigration reform might make winning the Republican nomination harder (although polls show a majority of Republican voters favor a conditional path to citizenship, primary voters tend to be more conservative than Republican voters over all). 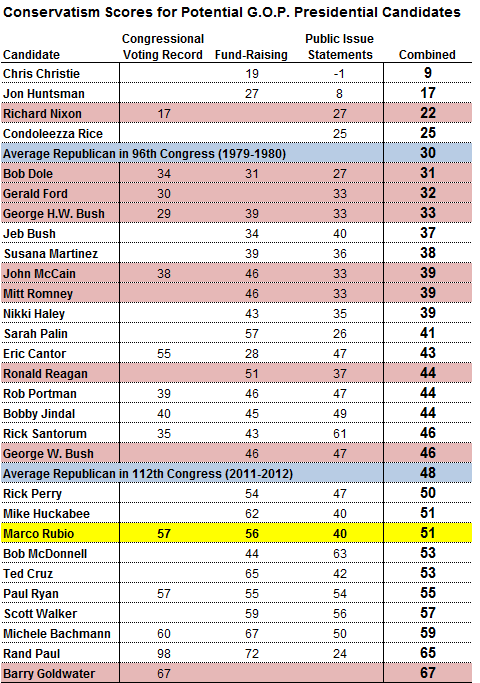 But Mr. Rubio will still be able to point to a deeply conservative record on many other issues. And were he to emerge as the Republican nominee in 2016, his stance on immigration could help him in a general election. Ultimately, Mr. Rubio’s political talent will help determine whether he can minimize his losses on the right and maximize his gains in the middle.